This Year, I Will . . . .
New Year's Day traditionally inspires resolutions. We reflect on what we want to change, and commit to do whatever necessary to make the metamorphoses we desire. Often, at the first sign of struggle, we declare ourselves failures and throw in the towel, only to repeat the process the next year. I'm guilty of that, as well. For example, my weight has not been where I would like it to be in more a decade. Ever the optimist, I plan to eat healthier, exercise more, and in general, treat my body well. Will this be the year that my efforts are consistent enough to outweigh the inevitable setbacks? I hope so, but that remains to be seen. Resolutions are about so much more than the stereotypical "lose weight" goal, though. The new year gives us an excuse to try new things, learn new things, and give ourselves permission to break free of a humdrum routine and add some fun into our days. At the end of 2016, John received a camera for Christmas. He had requested one, then promptly (and very graciously) told me he wanted the camera to come with a photographer--in other words, he made me the primary user. Although I still take quite a few photos with my phone, nothing beats a good camera. Even though I've been using the camera for a year, I haven't taken the time to really learn everything about it. Every full moon, I think, "I really need to figure out how to take a good photo of the moon!" I gaze at the moon, sometimes take a blurry shot or two, then forget about it until the next month. Tonight, as we were leaving John's sister's house, I noticed the supermoon rising, and again felt that desire to be able to capture the moment. As we drove home, a magical thing happened--the moon retreated and disappeared behind the mountains. Not only did we have time to drive home (where the camera was), but I also had time to do a quick Google search: "How to take a photo of the moon." 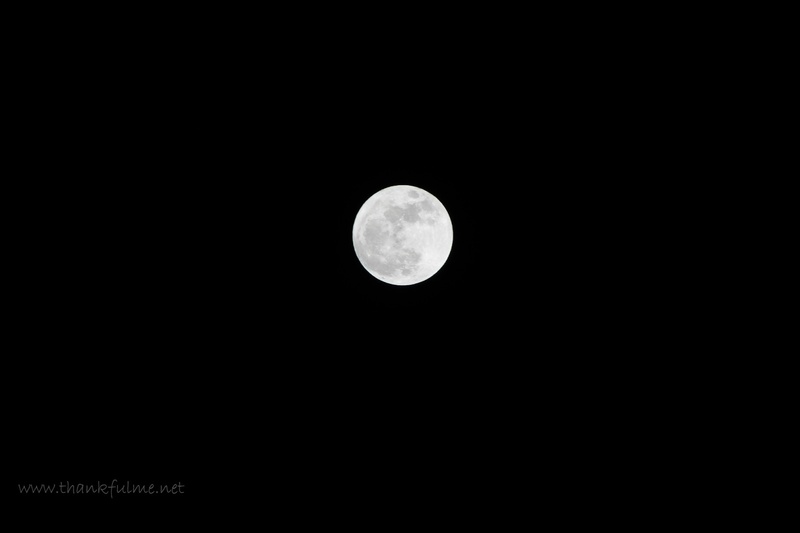 I put the camera in manual mode, set the ISO, aperture, and shutter speed, and waited for the moon to rise. While the resulting photos are not perfect, I'm so pleased that they show the moon as textured, and not just an unfocused blob of light. 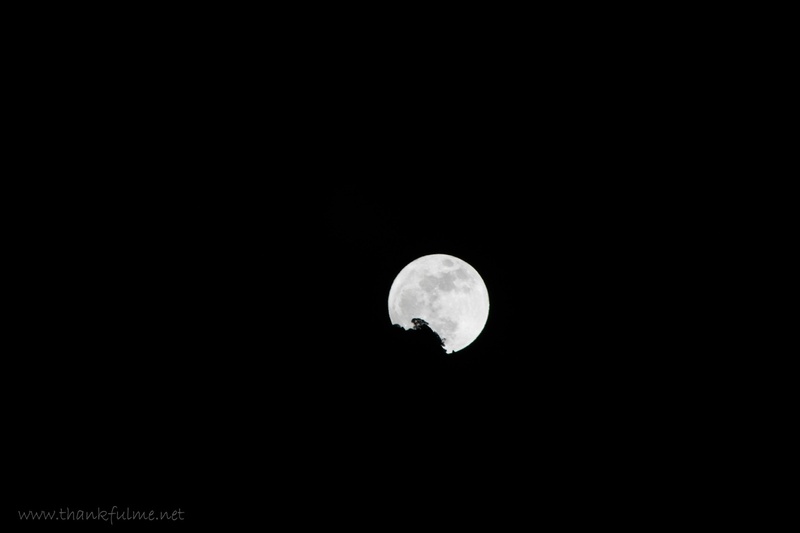 Photo: An uncropped, untouched (with the exception of adding a watermark) photo of the moon rising. A shadow of a tree blocks part of the moon. I still don't know everything about taking photos of the moon, let alone everything about using the camera, but I'm feeling good about my small step in the right direction. It wasn't a giant leap for mankind, but it was a positive move for me. As I contemplate what I will do this year, perhaps the most significant resolution I will set is to find joy in my attempts at improvement. What are your thoughts about New Year's resolutions? Nice photos of the moon! I look forward to more images in the months ahead. I was so amazed how easy it was, once I followed the suggested settings. I try to set goals instead of resolutions and break them into steps. I don't often succeed though. I hope you and your family have a happy and healthy 2018! Breaking down big goals into smaller steps is a good way to do it.